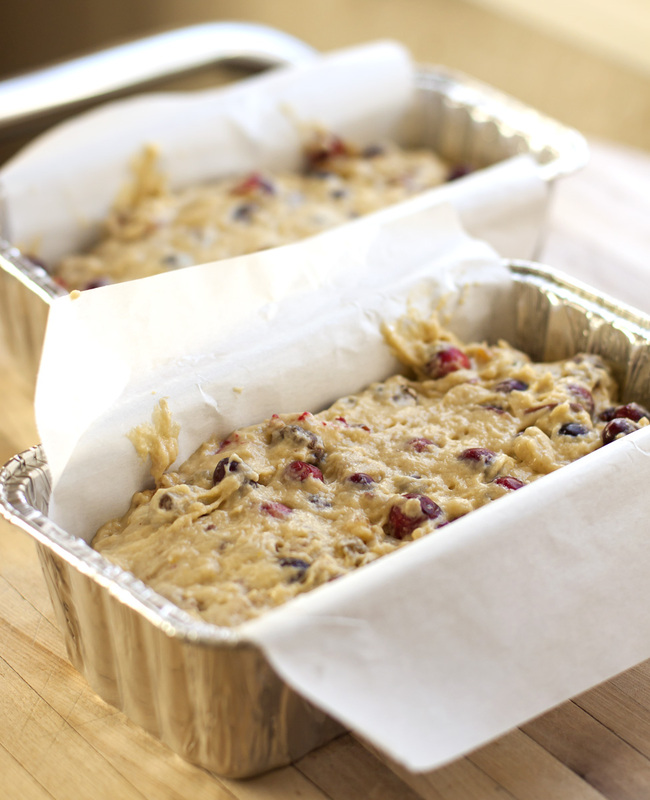 Double Cranberry-Orange Chestnut Bread… It's NOT Fruitcake! 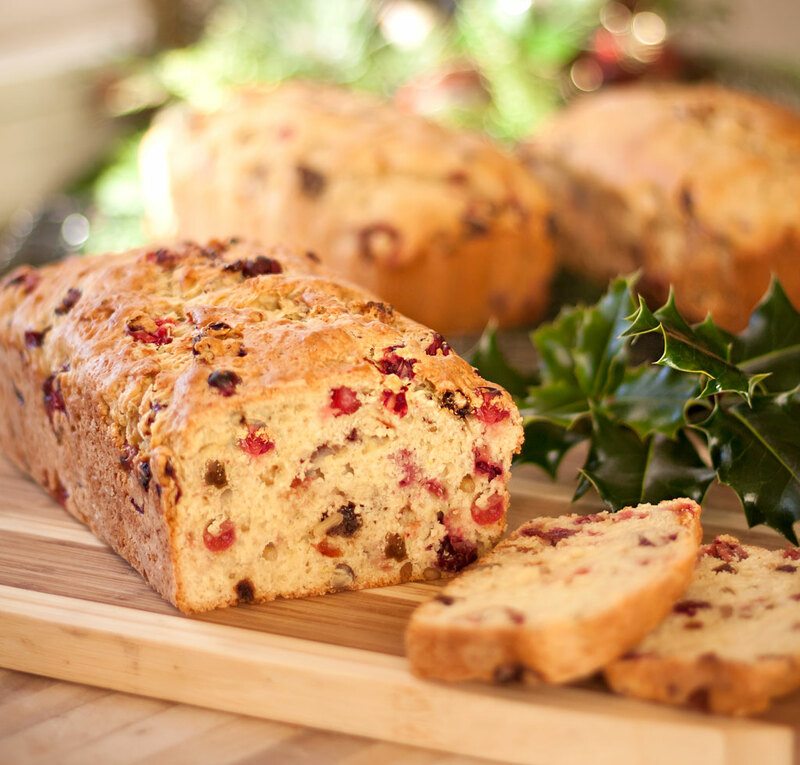 Double Cranberry-Orange Chestnut Bread… It’s NOT Fruitcake! Fruitcake. Some love it, some loathe it. 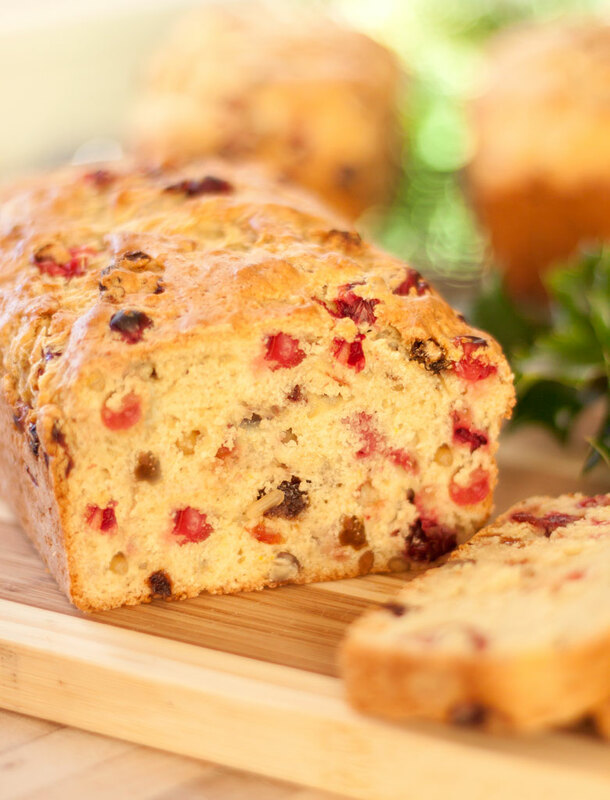 Here’s a holiday fruit & nut bread that EVERYONE can enjoy. Unlike the dense, heavy traditional fruitcakes filled with luridly colored candied fruit, our Double Cranberry-Orange Bread is light in texture and not too sweet. Each bite is bursting with tangy fresh and dried cranberries, plus orange zest & juice. It’s the perfect end to a meal or accompaniment to a cup of tea or hot cocoa on a brisk wintry night. 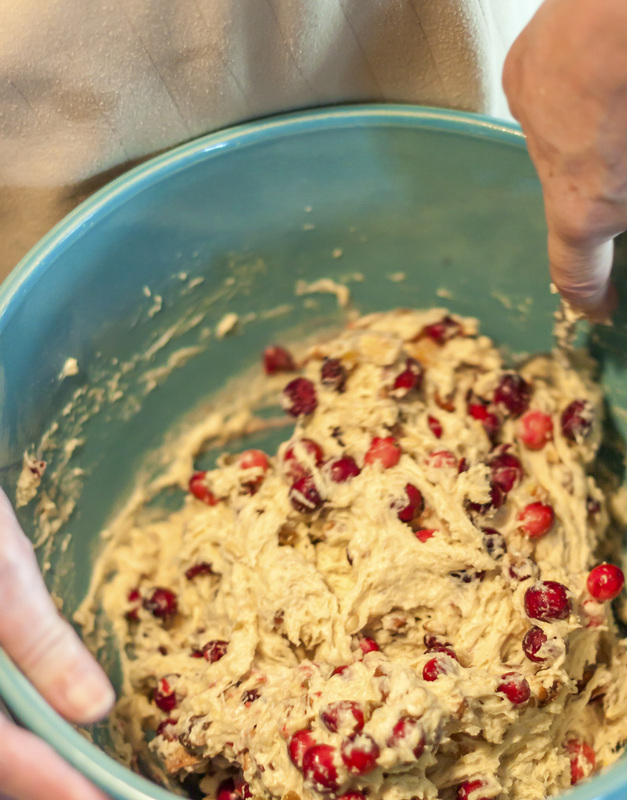 We’ve been making a version of this cranberry bread for over 20 years, but it never gets old. The constituent ingredients tend to vary from year to year, according to what’s on hand, but that just keeps things interesting. This time around, we included tender, moist chestnuts and an assortment of other toasted nuts for crunch and flavor, plus plump golden raisins and chopped dates. This version turned out so well that we’ve already made two more batches to share with friends and neighbors. Who knows – maybe we’ll make it exactly the same next year. The following instructions break down the process into simple, easy-to-follow steps. After making this recipe for many years, we’ve found this to be most practical method to achieve consistently good results. 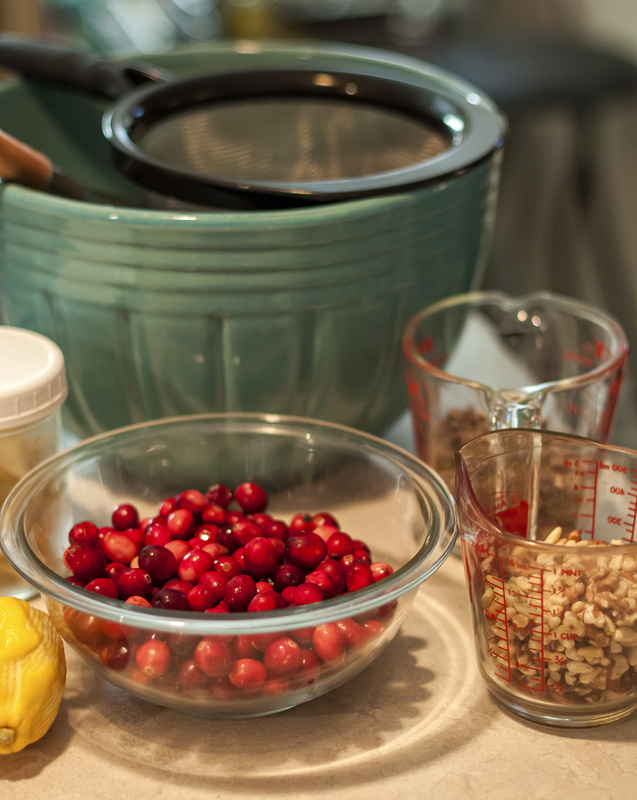 If you take the time to prepare and measure out your ingredients ahead of time, you’ll find that the actual mixing & baking go very quickly. Gently stir the wet ingredients into the dry ingredients to form a sticky batter. 1 pound coarsely chopped peeled and cooked chestnuts or a blend of chestnuts & toasted almonds, walnuts and/or pecans. Prepare two 9” x 5” x 3” loaf pans, or smaller loaf pans by spraying with oil and lining with parchment paper cut to width size and extending over the edges by about an inch. Spread into the prepared loaf pans and bake 45 minutes – 1 hour for large pans or 30- 45 minutes for small loaf pans. The loaves are ready when a toothpick or skewer inserted in center of bread comes out clean. Remove bread from pan by lifting the parchment paper “handles.” Let cool on racks for about 10 minutes, peel off parchment and let cool completely. This recipe can be doubled. If making more than two loaves make in 2-loaf batches. This delicious bread freezes exceptionally well, so make a double (triple?) batch while you’re at it. Wrap whole or cut loaves tightly in plastic and then with aluminum foil and freeze for up to 4 months. Serving suggestions: Delicious when toasted and topped with butter, cream cheese or yogurt cheese. Also makes fantastic French toast!